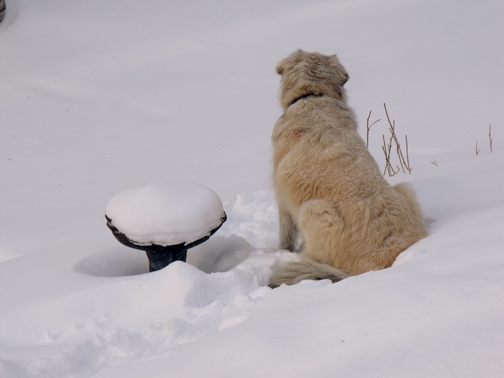 Guarding the Birdbath against all comers…. And you’re doing an excellent job Stella! I LOVE birdies too! If we had a bird bath, I would sit by it too! I do watch the bird feeder though! I love the photo you posted!!!!! Report back to us Stella on how many birdies try to sneak past you! Oh! I was guarding it FOR the flappers! The wolves have been busy and there are a lot of big, predatory flappers hanging around right now…. I’m afraid they might come after my little friends. Usually if I woof at the big flappers, they fly off. They don’t want to risk seeing if I’ve sprouted flappers of my own – BOL! Definitely watchful Wednesday. You go girl! Guarding is important work. It’s good of you when there’s so much snow to play in! I’ve had such a busy week guarding, Clowie. You have no idea! I’ll be writing about it for Tuesday’s blog.